Parking lot accidents in Miami happen everyday, with millions of accidents reported every year across the United States. Most parking lot accidents in Miami are caused by negligent motorists, pedestrians, property owners or parking lot operators. Some 18% of all reported motor vehicle accidents take place in parking lots, with 15% of parking lot accidents resulting in damage due to a collision with another motorist. Many parking lot accidents that take place in Miami parking lots may result in personal injury from a parking lot car accident involving a pedestrian entering, exiting, or passing through a parking lot in Miami. There are several ways parking lot accidents in Miami can involve pedestrians, cyclists, or other motorists. Parking lot accidents involving pedestrians in Miami may take place at supermarkets, shopping malls, restaurants, hotels, night clubs, private parking lots, etc. Children and the elderly are at high risk of falling victim to parking lot accidents in Miami. 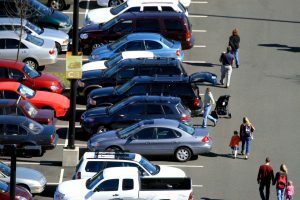 Children may stray from a parent or legal guardian and fall victim to a parking lot accident in a Miami supermarket, shopping mall, or restaurant. Kids are difficult to spot when backing-out, and a large number of car accident related incidents in parking lots in Miami that involve small children result in severe and sometimes wrongful death. A parked motorist’s view may be obstructed by a larger vehicle parked to its side, and back-out hastily into an inattentive elderly pedestrian. Many times, parking lot motorists in Miami are more focused on finding a spot than looking out for other cars, some of which don’t respect the existing established lanes and traffic laws which motorists must abide by when operating a motor vehicle in a parking lot in Miami. Property damage in parking lot accidents in Miami establishments may result from shopping carts colliding with a parked car or crashing into a pedestrian. – I was crashed into while driving through a parking lot in Miami. – I was run into while crossing through a parking lot in Miami. – I was run into while riding my bike through a parking lot in Miami. – A shopping cart rolled into my car and scratched the paint. – A slippery substance caused me to slip and fall. I suffered personal injury that required medical attention. – I was robbed while getting in/out of my car in a Miami parking lot. – My car was vandalized while parked in a parking lot in Miami. – My vehicle was damaged due to unsafe conditions in a Miami parking lot. – I was crashed into by a vehicle exiting a parking lot onto the street. The Perazzo Law Firm Personal Injury staff recommends parking lot accident victims to handle parking lot accidents that result in personal injury, property damage, or loss in the same way they would a car accident on a Miami street. Seek eyewitness testimony, contact the authorities, seek medical assistance if needed, and keep all medical records. The Perazzo Law Firm urges parking lot accident victims to contact the Miami or the North Miami Beach office to find about more about parking lot related accident insurance claims in Miami. THE PERAZZO LAW FIRM – PUTTING YOUR INTERESTS FIRST, ALWAYS!